I remember visiting the Picasso Museum in Barcelona and being fascinated by one of Picasso’s school text books on display. I can’t remember the textbook’s subject because that part was irrelevant. My fascination lay in what had been drawn in the margins. I imagined a young Picasso bored by his teacher and distracted by a clearly more pressing issue as you could see pencil marks erased, redrawn, and drawn again. He was trying to get the right angle, shape, and musculature on the arm of a figure he was drawing. Looking at artists’ sketchbooks can offer an intimate glimpse to their process, obsessions, struggles and daily life. 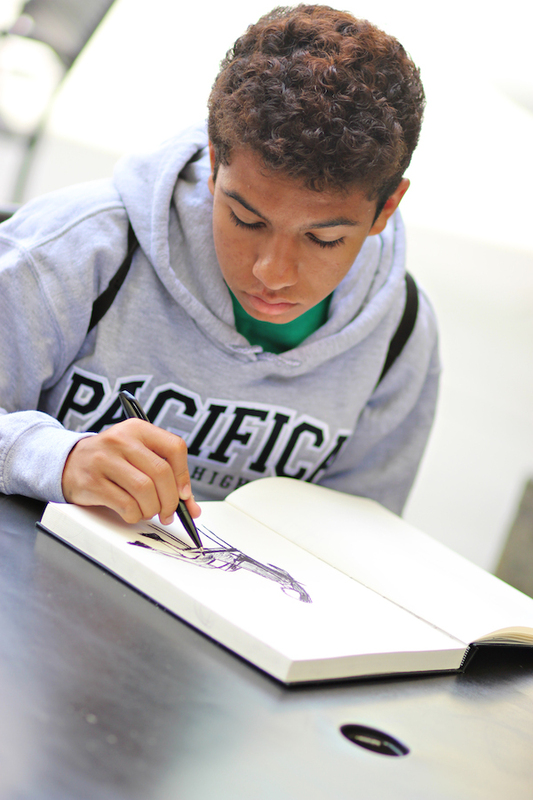 At LACMA, students often use and make sketchbooks to record their observations, ideas, and reflections. I spoke with LACMA teaching artist George Evans, who has hundreds of sketchbooks, about his lifelong relationship with this mobile medium. 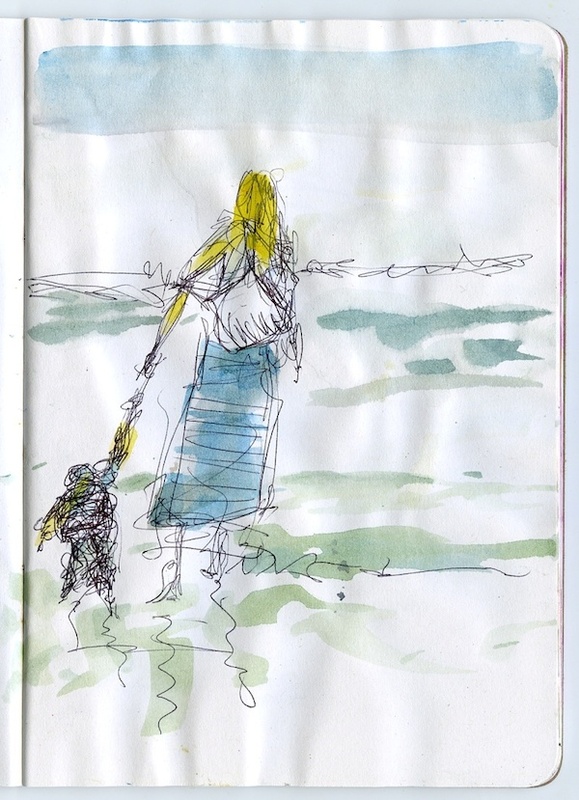 Karen Satzman: You often teach our teen Sketchbook class. Tell me about your first sketchbook. George Evans: My first sketchbook came from my dad— I took his! My dad was a sign painter. He could draw. I had my first sketchbooks in junior high. In high school, I studied with Bill Tara and Bill Pajaud at Tutor Arts. (The Tutor Arts Program was founded by artists Bill Tara, Bill Pajaud, and Charles White.) Every Saturday we had to have five drawings; it set a standard. We were told “your sketchbook is your studio,” and that clicked for me. As long as you have a sketchbook, you can work anywhere, on the bus, in the park. I would come to LACMA and Barnsdall to draw from the collection and in the park. Submitting my sketchbook with my Cal Arts application played a big part in getting a scholarship. I still see Bill Pajaud, and he still has his sketchbooks from the 1950s, when he was at Chouinard (now known as Cal Arts). When I see him I always bring my sketchbook to show him what I’m working on. We still have that kind of relationship. KS: What is the role of the sketchbook for you? My sketchbooks have followed me all of my life. Keep myself growing and document my ideas. A sketchbook is a passport. Part of my sanity. You can express yourself fully. It is your prerogative to share or not. KS: Do you share yours or keep them private? GE: Well, I just showed you mine! KS: True! So, how many do you have? GE: Hundreds! Some are damaged. They go all the way back to high school. I lost the ones from junior high. And, I just got an iPad. I use the Procreate app. I am experimenting with observational drawing. It is a different tool. It does things differently, makes me curious to look at things differently. KS: Where do you keep your sketchbooks? GE: Wherever I can. The old ones are in plastic tubs. Ones from the last 10 years are in the house on bookshelves. KS: Tell me about teaching. GE: I use a lot of the same ideas I was taught with at Tutor Arts. They would say. “Draw in your room, draw the clothes in your closet.” You are studying drapery, see? This is how it works. No erasers! I have them work in pen. It is a commitment. Learn to work with your mistakes. At Tutor Arts we drew with sticks and ink. Unconventional methods make you see things differently. KS: What can we learn by looking at an artist’s sketchbook? GE: I’ll never forget looking at one of Marc Chagall’s sketchbooks—there was one drawing, just after his baby was born. It looked like a cabin, with a baby at the table, food at the table. Shows how the artist captures simple, everyday life. Different from photography; things a photo can’t say, a sketch can. 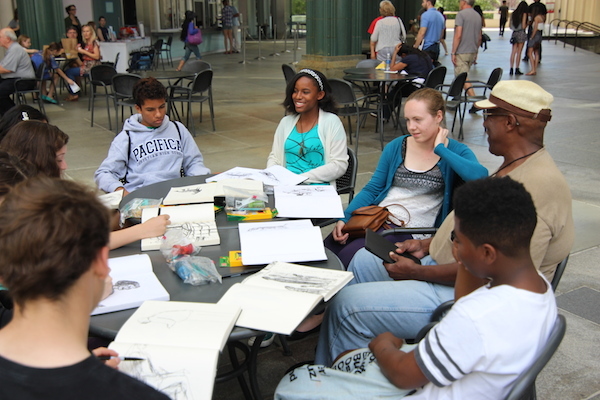 George Evans next Sketchbook class at LACMA is designed for teens. Small and portable, sketchbooks are a perfect discovery for this on-the-go group! Class starts on Saturday, September 13. For more information or to enroll, call the Ticket Office at 323 857-6010 or click here. This entry was posted on Wednesday, August 27th, 2014 at 7:30 am and is filed under Uncategorized. You can follow any responses to this entry through the RSS 2.0 feed. You can leave a response, or trackback from your own site.